Waterworks is the annual PWS members-only exhibit. Each member may submit one piece. The Store allows members to sell small paintings, cards, matted and wrapped giclee prints and related items during gallery hours. No registration required although you may register online, Members, just show up with your piece and prints, cards, etc. 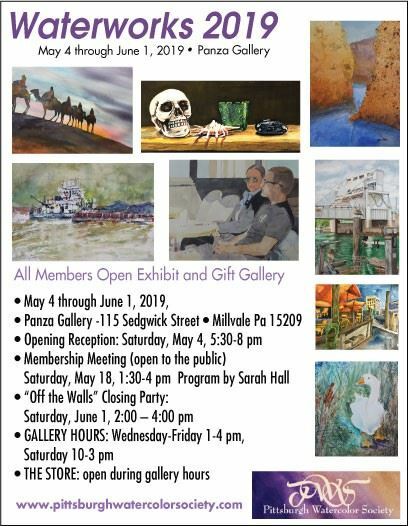 If you would like your work to be considered for the Waterworks advertising postcard, please submit a digital image of your work to waterworks@pittsburghwatercolorsociety.com by April 5, 2019..
For "store" prospectus, click here for PDF document or here to download Word document. To register online, click here. You may pay securely online or bring a check for $15 made out to PWS to the drop off.